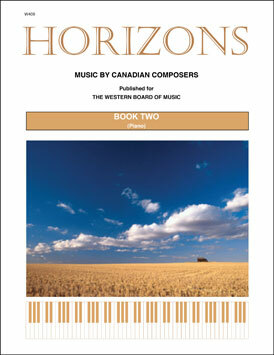 Horizons, Book 2 is a collection of eight piano pieces, offered as a continuation of Book 1. While the first collection dealt exclusively with music derived from the use of scales which were not the traditional major and minor ones, the pieces here explore more advanced techniques of composition, without exceeding a modest level of difficulty. Besides various concepts of rhythm, they offer more recent developments in open/free forms, improvisation and notational practices. Commissioned by the Western Board of Music.